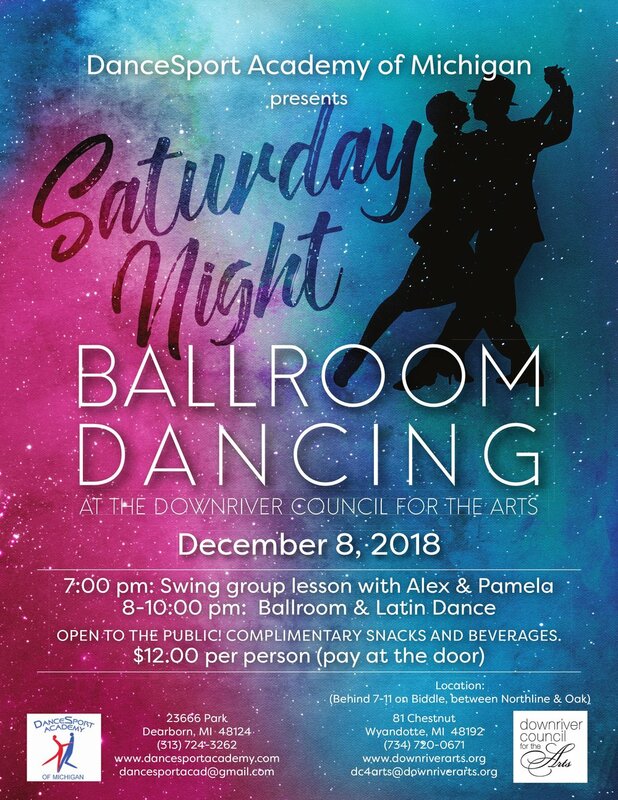 Alex and Pamela from DanceSport Academy of Michigan will teach an Swing group lesson from 7-8:00pm and the Ballroom/Latin Dance will take place following the group from 8-10:00pm. The cost for the evening is $12/person. The evening will include music dj’d by Alex. Snacks and beverages will be included. We encourage everyone to give this location a try. The Downriver Council for the Arts is located at 81 Chestnut in Wyandotte. The DCA is a historic building with wonderful possibilities for the dancing. The DCA regularly hosts art exhibits and offers classes and workshops in the arts. OPEN TO THE PUBLIC! All skill levels welcome. Don’t have a partner? No worries, many people attend without a partner and find great support in learning to dance. Complimentary snacks and beverages.